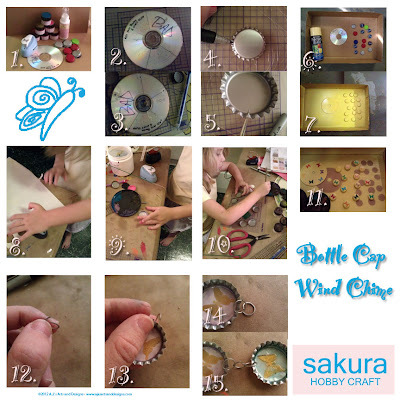 Bottle Cap Wind Chimes for Sakura Design Team | Who Are You Calling Crafty? For this Design Team Project for Sakura we had to take bottle caps from The Bottle Cap Company to create an object. I decided to create a wind chime with the Princess’s help. She love the fact she got to use the Mixers and her new butterfly punch. 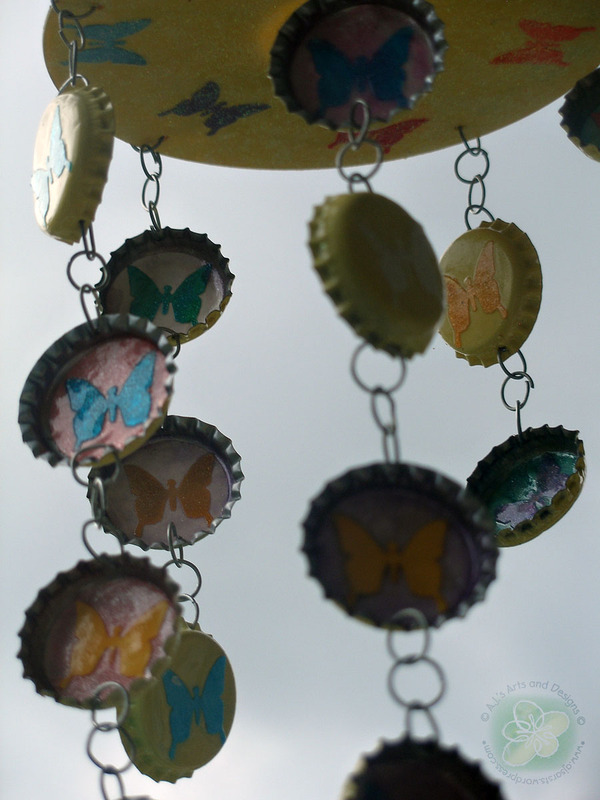 I am happy I created a wind chime that actually makes noise and looks pretty cool hanging outside. 2. Mark off lines 1 1/2″ and drawn lines. 3. Poke holes 1/4″ from the edge (there should be 5 holes). 4. Mark a dot on each side of the bottle cap. 5. Take a pokey tool pierce through the metal of the bottle cap. 6. I wanted all of my bottle caps the same color, so I took spray paint and spray painted everything. 7. Allow the spray paint to dry. 8. Taking a 1″ Circle punch and punch 15 circles. 9. 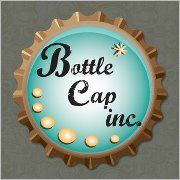 Take 3D Crystal Lacquer and add one circle to the inside of each bottle cap. Add a mixer of Crystal Lacquer and Shimmer to Acetate. Allow acetate to dry. Take mixers and lacquer mixer and add to the inside of the bottle caps. Allow the bottle caps to dry. 10. Take butterfly punch and punch butterflies out of the acetate. 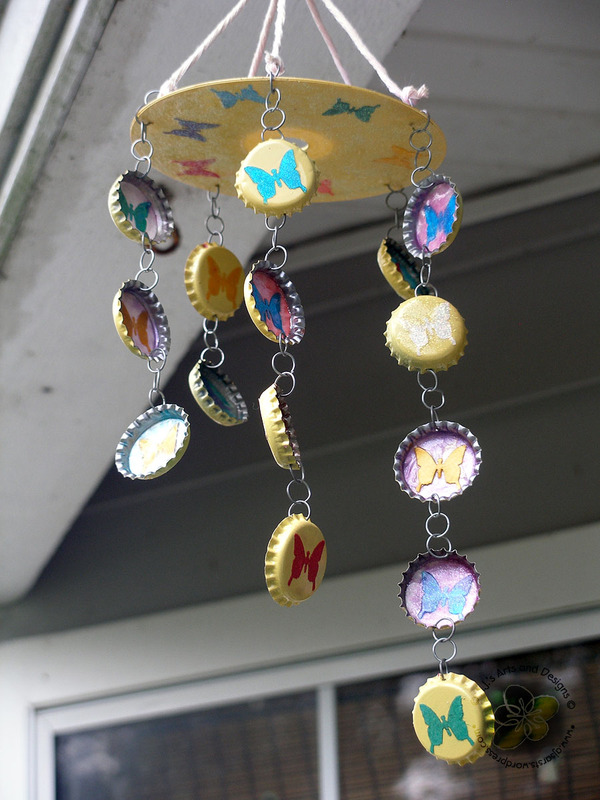 Add butterflies to the inside and the outside of the bottle caps with 3D Crystal Lacquer. 11. Allow Crystal Lacquer to dry. 13. Place one jump ring through the hole. 14. Attach a second jump ring to the first jump ring. 15. Attach the other bottle cap to the jump ring. Repeat until you have 1 – bottle cap on 3 jump rings, 2 – bottle caps hooked together, 3 bottle caps hooked together, 4 bottle caps hooked together, and 5 bottle caps hooked together. Attach the bottle caps to the DVD with jump rings. Take Bakers Twine and attach 5 pieces of twine to the top and create a hanger. Hang outside. I will remember to bookmark your blog and will eventually come back in the future.